Course Aims: The CPCS A36 course aims to provide the candidate with a thorough practical and theory training in operating a Lorry Loader in order to to enable the candidate to pass the CPCS Theory and Practical Tests. Confirm with manufacturer’s requirements as per the operator’s handbook, other types of information source and relevant regulations and legislation. 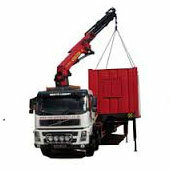 Undertake all pre – use checks on the host vehicle and loader crane. Configure the vehicle and loader crane ready for travel. Travel the vehicle to an area of work. Program/set – up and/or comply with Rated Capacity Indicators or Load Moment Indicators for lifting duties. Identify weights and centers of gravity of loads. Lift various loads using the full radius and slewing capabilities of the loader crane. Place loads accurately at designated positions including on/into and from the vehicle. Explain the use of, types and fitting of boom extensions. Secure loads on or in the vehicle. Explain different types of lifting accessories compatible with loader crane use. Course Requirement All visitors must report to reception on arrival and follow site safety rules at all times.There are no catering facilities on site, so delegates need to provide their own lunch. There are tea and coffee facilities available. The CPCS Theory test is recorded digitally by the tester to ensure adherence with CPCS Standards. The CPCS Practical test may be recorded using a Video recorder if the CPCS request it. Examination Board The Construction Plant Competence Scheme (CPCS) is recognised by the UK Contractors Group (UKCG) and Major Home Builders Group (MHBG) as the preferred card to comply with codes of practice for competence and certification. It was launched in 2003 to help them comply with regulations and requirements and aims to apply common standards for all plant operators.CPCS is owned by the Construction Industry Training Board (otherwise known as CITB). For more information visit their website at www.citb.co.uk. Assessment To achieve the Red CPCS Trained Operator Card candidates must pass both the CPCS Theory Test and the Practical Test.These tests can be viewed online by clicking here. Refresher / Re-qualification Information Once you have achieved your Red CPCS Trained Operator Card it lasts for 2 years.During these 2 years you must work towards and achieve your NVQ in Plant Operations to upgrade to a Blue CPCS Competence Card. Total Construction Training may be able to offer you funding towards this NVQ.